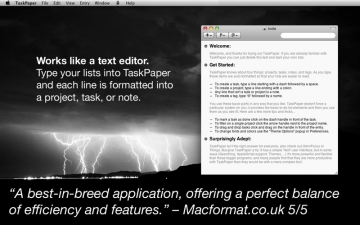 [値下げ] TaskPaper | Mac App Storeのアプリ検索・ランキング BuzzMac! For Mac users to make lists and stay organized. TaskPaper is a simple to-do list that’s surprisingly adept. Unlike standard organizers, TaskPaper gets out of your way so that you can get things done. Type your lists into TaskPaper and each line is formatted into a project, task, or note. TaskPaper doesn’t force a particular system on you; it provides you with basic to-do list elements and then you use them as you see fit. TaskPaper has a magic trick. It understands your list's structure and will instantly filter your list to show only items of interest. TaskPaper’s filter system is simple to use—focus on a particular project or tag with a single tap. It also supports advanced searching if need. "A best-in-breed application, offering a perfect balance of efficiency and features." "Chances are you’re looking for something with a good interface and that ultimately helps you be more productive; Hog Bay Software’s TaskPaper satisfies both requirements"
"TaskPaper’s strength is that it lets you focus on crossing out those tasks instead of building a self-referential web of unfinished business which separates you from the cold, harsh reality of all the work you need to do."